Ladies, have you noticed changes in strength right before, on, and around your menstrual cycle compared to the rest of the month? For women, and men who train women, its important to understand the hormonal changes that will have an impact on training. Women on birth control experience different hormonal fluctuations compared to women who are not on birth control. Fluctuations are seen in 17 alpha hydroxyprogesterone, 17 beta estradiol, androstenedione, endothelin 1, active renin, angiotensin II, atrial natriuretic peptide, luteinizing hormone, follicle hormone, follicle stimulating hormone, prolactin, progesterone, estrone, and testosterone levels throughout the menstrual cycle. Studies have also found that testosterone appears to peak the day prior to menses (aka period starting, bleeding). As you can see, the large fluctuations in hormones could quite easily lead to large fluctuations in strength depending on the time of month for a woman. However, some studies show strength was not affected throughout the menstrual cycle. So what gives? A brand new study recently published showed some cool findings. 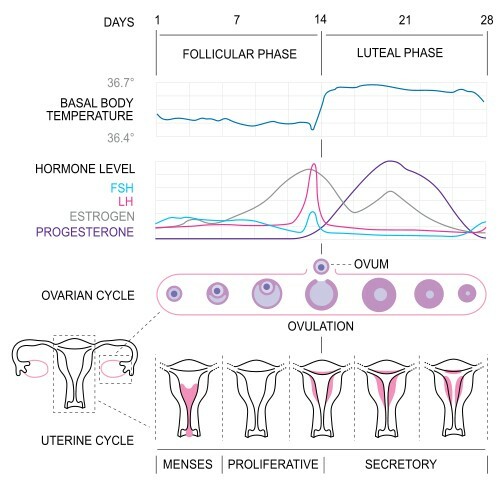 First, testosterone levels are higher during the follicular phase compared to the luteal phase of the menstrual cycle. And second, that strength and muscle mass gains are greater during the follicular phase compared to the luteal phase of the menstrual cycle. Researchers show that these same trends do not exist in oral contraceptive users. They concluded that non-oral contraceptive (natural) subjects see fluctuations in strength and adaptations due to fluctuating hormonal milieu, whereas oral-contraceptive (pill) users have more consistent hormones and therefore more consistent levels of strength and adaptations. They also suggested the following: We recommend that eumenorrheic females without oral contraceptives should base the periodization of their strength training on their individual menstrual cycle. Ladies, you have a glaring additional variable in your training compared to men – your hormones fluctuate markedly, whereas ours do not. These fluctuations are much larger in women who don’t take birth control pills compared to women who do. Start paying attention to your strength levels throughout the month. Do this for a period of around 6 months to get an accurate handle on whether or not your strength waxes and wanes. If it doesn’t, then don’t concern yourself with this phenomenon. However, if it does, and you find that you’re consistently setting PRs during certain phases of your menstrual cycle compared to others, then you should “periodize” your training according to your periods. Don’t try to set a PR when your strength is weakest. Instead, try to peak and go for PRs when your strength is greatest (perhaps right before or after your period starts, but it certainly depends on the individual). And don’t be alarmed if and when your strength dips during other portions of your cycle.